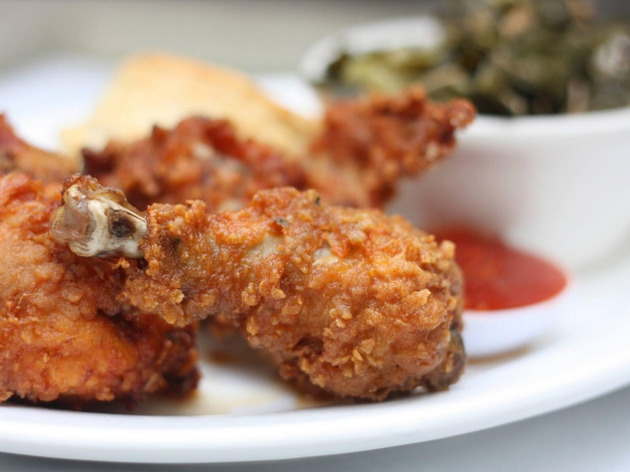 Fried chicken is no simple thing to nail: there’s the moistness of the meat, the texture of the skin, the spice, the temperature, the grease. These spots—from a Styrofoam-slinging walk-up window to a high-end eatery whose herb-flecked, buttermilk-brined version takes over three hours to cook—take the challenge seriously. 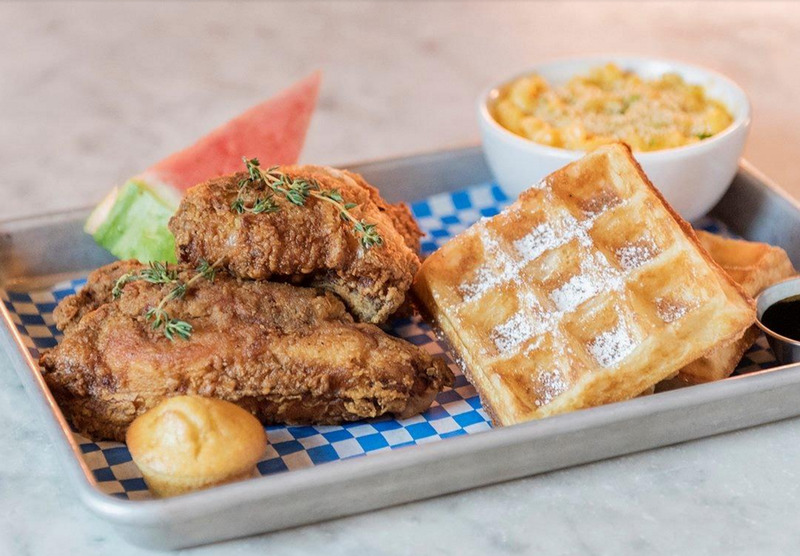 Whether you’re craving a Nashville-style sandwich, a bed of waffles or a diet-be-damned bucket, these are the best places for fried chicken in San Francisco. Just don’t forget the sides. The Front Porch is generous with their portions—you can get a 10-piece bucket for roughly the same price as some of the fancier two-piece meals on this list. 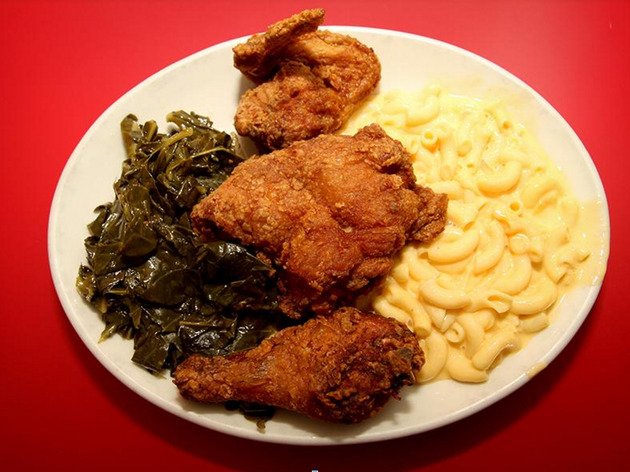 The single, four-piece meal is served alongside a mound of garlic mashed potatoes and gravy and ham hock collard greens. 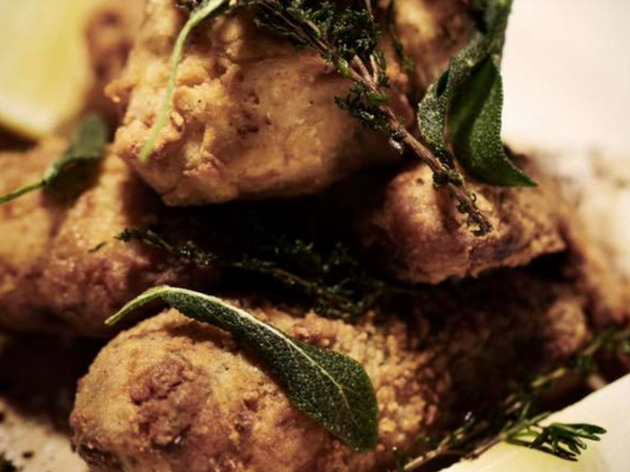 The flavorful organic chicken comes from Mary’s Chicken and the batter is a zingy combination of cornmeal, flour, thyme and (brilliantly) lime zest. 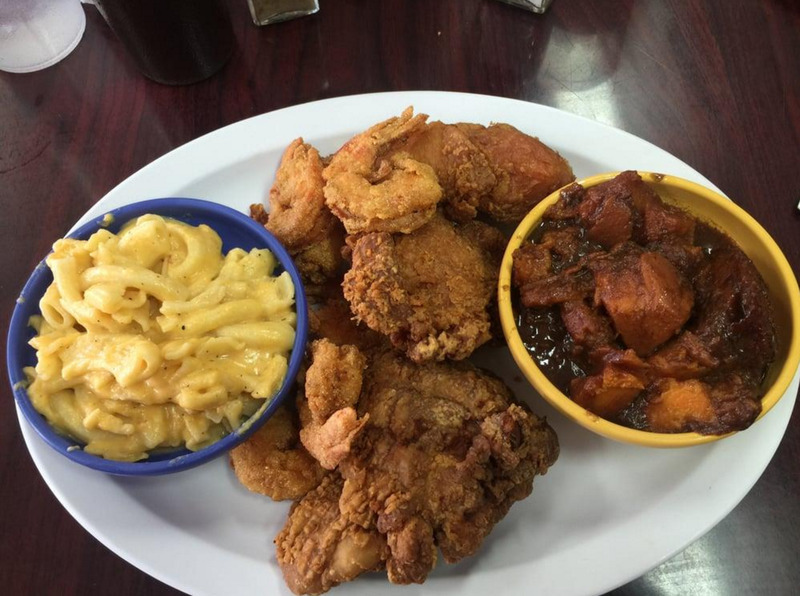 It’s brined, then fried to textured perfection. 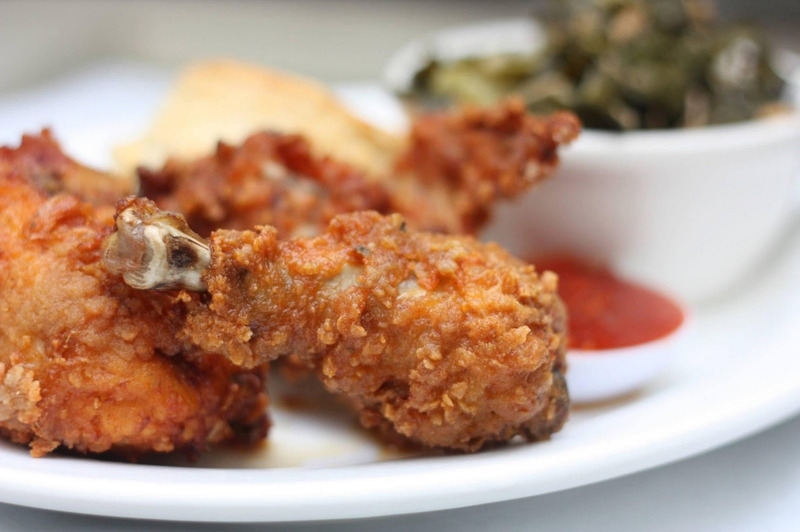 Pair it with sides like blue-crab hush puppies or fried pickles. This alleyway walk-up window—an offshoot of Farmer Brown’s—used to be an experience unto itself: You’d know you were at the right place by the scent of the fryer, the bright blue shutters and the pack of strangers ravenously hunched over Styrofoam containers. Though the window remains, in 2014 Little Skillet also took over a bar counter at Victory Hall & Parlor next door, serving after 4pm for those who’d rather eat inside (and wash their meal down with a craft beer). 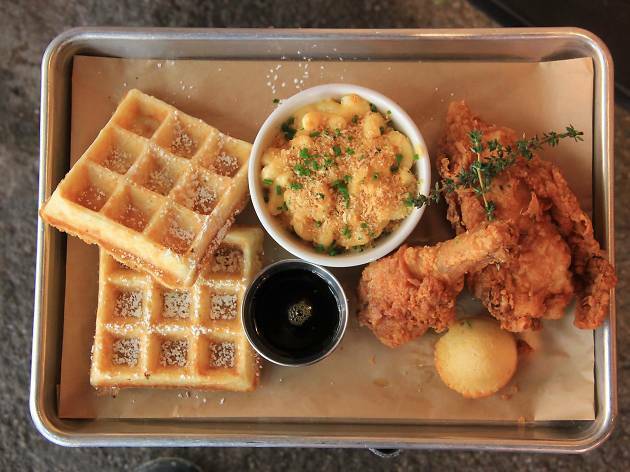 In both spots, you can order the crispy, extra-salty fried chicken as a 2-piece, 3-piece, or 8-piece meal, served with a powdered-sugar dusted waffle or a side dish like grits, sharp cheddar mac and cheese or coleslaw. 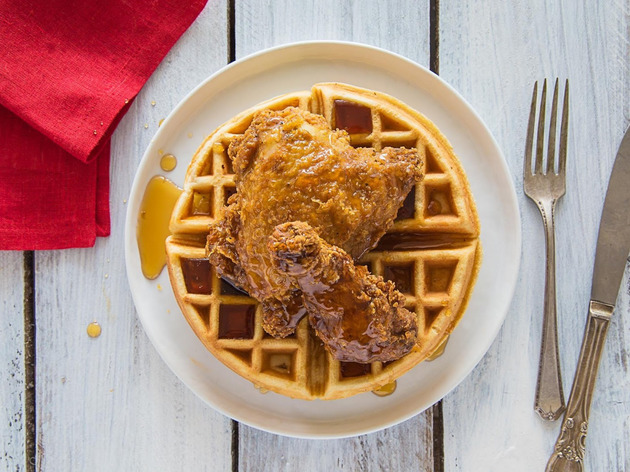 The waffle version comes with blackstrap molasses syrup, but Tapatio and Crystal hot sauce is on hand to balance out the sweetness. Take note: On days when the Giants play, the SoMa window is often swamped by a line. 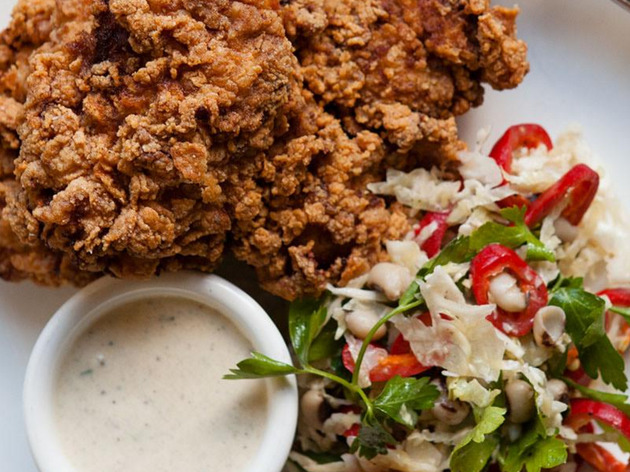 Food & Wine included this version on its list of the best fried chicken in the country for a reason. Celeb-chef Tyler Florence grew up in South Carolina, where he honed his taste for deftly-spiced fried chicken. 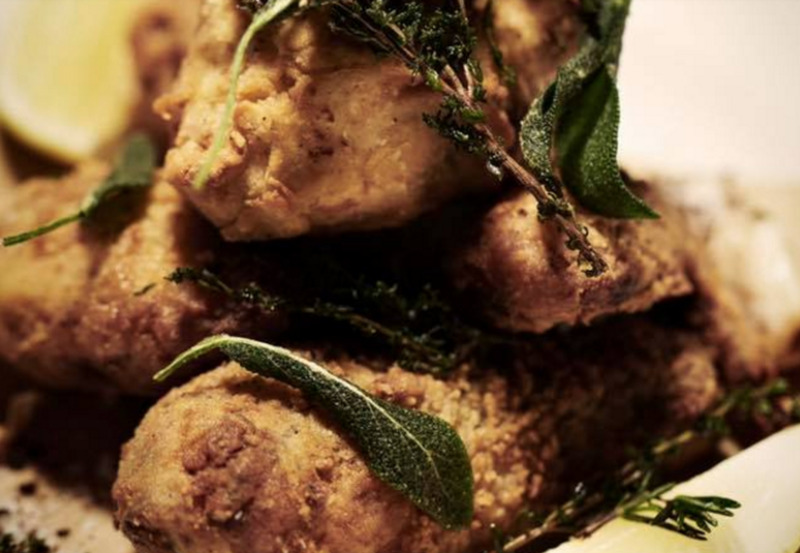 At Wayfare Tavern, his version is a little schmancy, with a buttermilk crust and topped with fried rosemary and sage, roasted garlic and lemon. 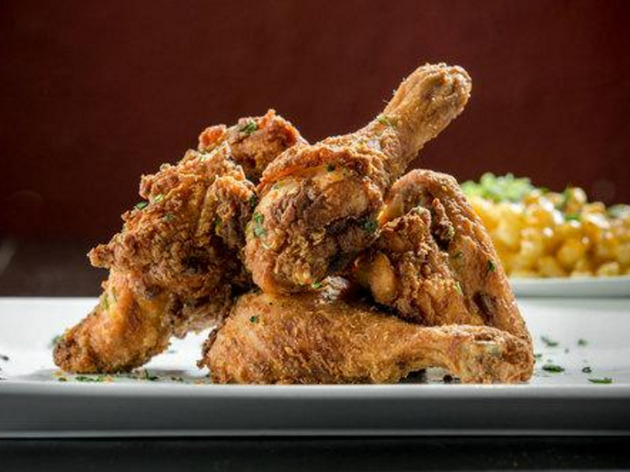 The secret is in the time-intensive preparation: The thinly-battered chicken is baked at 200 degrees for more than two hours before ever hitting the fryer, which leads to a rich, moist meat and a golden, crackly crust. 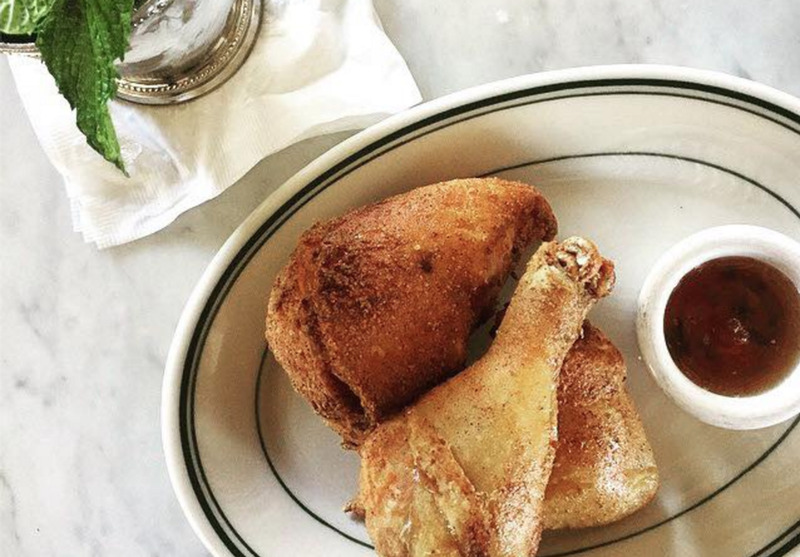 Three generous pieces of fried chicken—a bone-in breast, drumstick and wing—come with complimentary corn muffins and two sides for just $14. 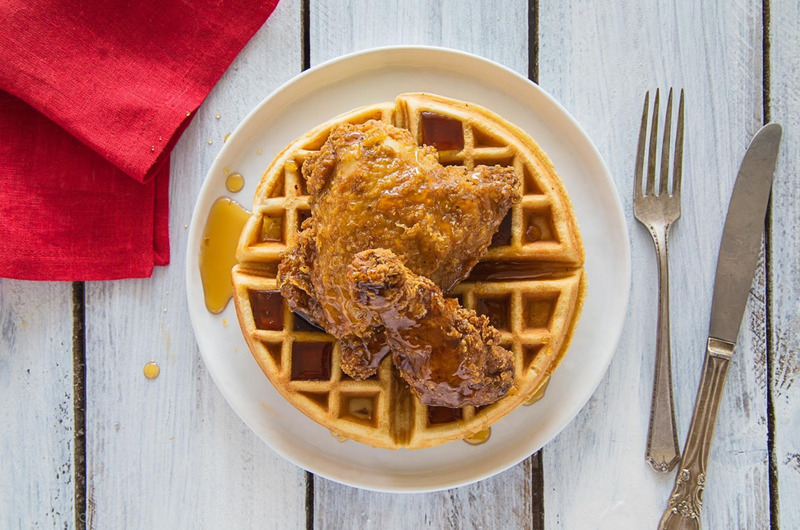 (You can also scrap the sides and have it served, sizzling-hot, on a buttermilk Belgian waffle or order it “smothered” with gravy and baked in the oven with onions, bell peppers and garlic.) The classic style is best, heaped alongside gut-busting sides like creamy mac and cheese, gravy-drenched potatoes and collard greens. 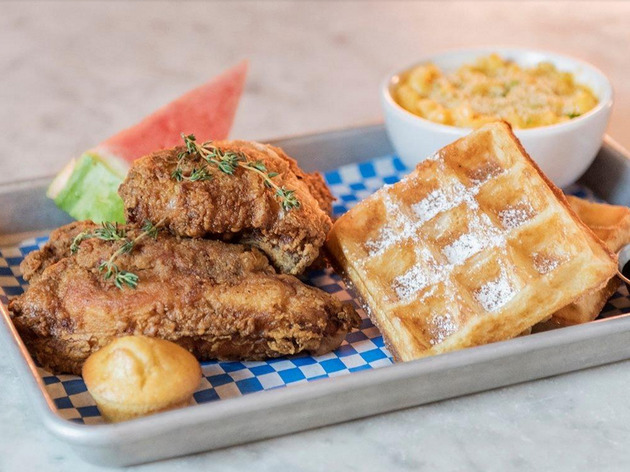 Though Hard Knox has opened a second location in the Richmond, the food is more consistent at the Dogpatch original, where the tin walls and kitschy decor lend a homey, old-school feel. Request the spicy option if you’re a heat-lover. 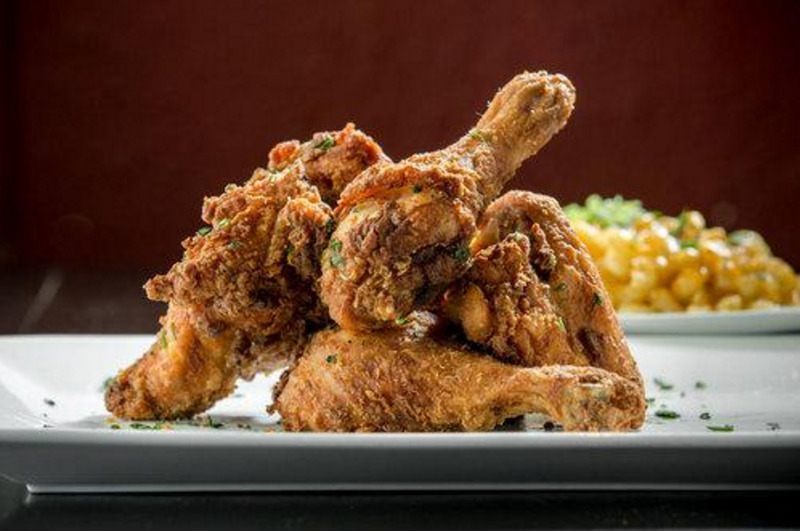 This swanky, youth-run supper-club is known for two things: jazz and Jordan’s Fried Chicken. The secret here is in the spice, a tasty blend of salty, tangy and sweet. 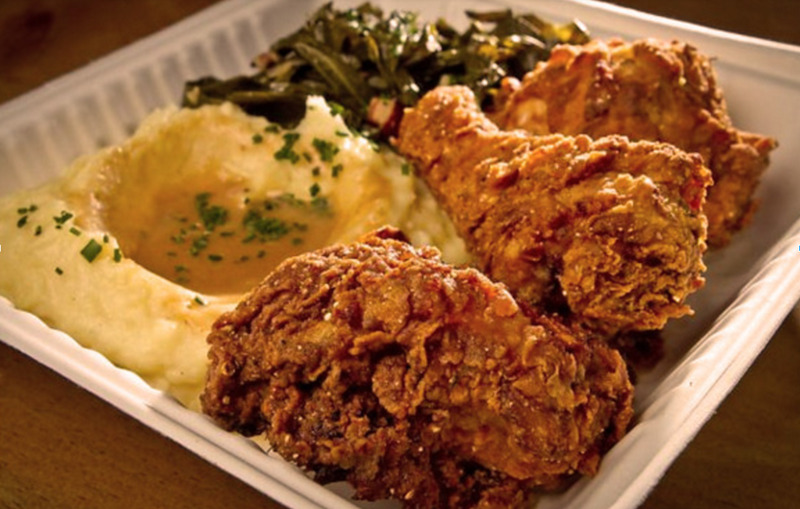 The portions are large (a half-chicken), served with gravy mashed potatoes and house-made coleslaw. It’s meticulously cooked: moist on the inside, crispy, spicy and not too greasy on the outside, and served promptly from the fryer. This ritzy, New Orleans-inspired bar by the team behind the Slanted Door is known for its backlit bar displaying hundreds of varieties of rare whiskies. But after a flight of brown spirits, you’re going to want to turn your attention to the other side of the menu. 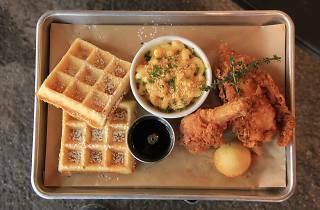 The fried chicken here is served three ways: Hard Water Style, with pepper jelly and dense buttermilk biscuits; Spicy Nashville Style, with bread and butter pickles and savory corn and almond cake; and “TKO”-style, on a biscuit with bacon, bread and butter pickles and slaw. 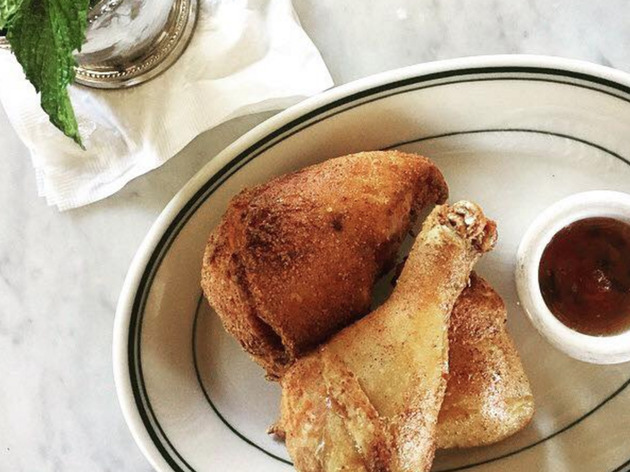 All the iterations allow the chicken itself to shine, served piping hot with a juicy interior and crispy skin. Tack on sides like fried green tomatoes and tangy, mustard- and malt vinegar- spiced Brussels sprouts. 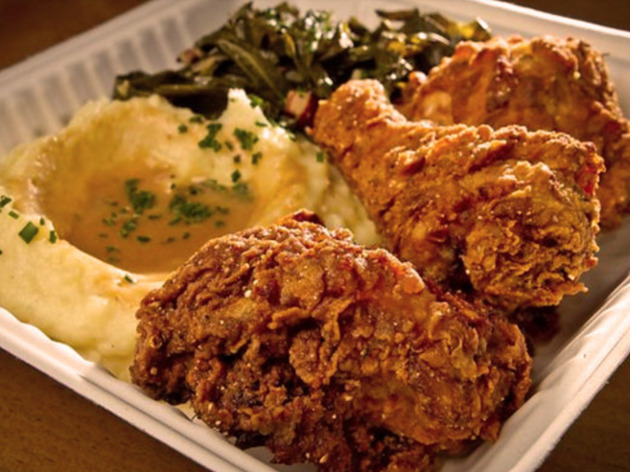 This Bayview mainstay serves up home style fried chicken for patient purists. The service can be slow and spotty, but the classic chicken (which is also available on a golden-brown waffle) is worth the wait. The batter packs a subtle cayenne punch, and the meat is chin-dribblingly juicy. 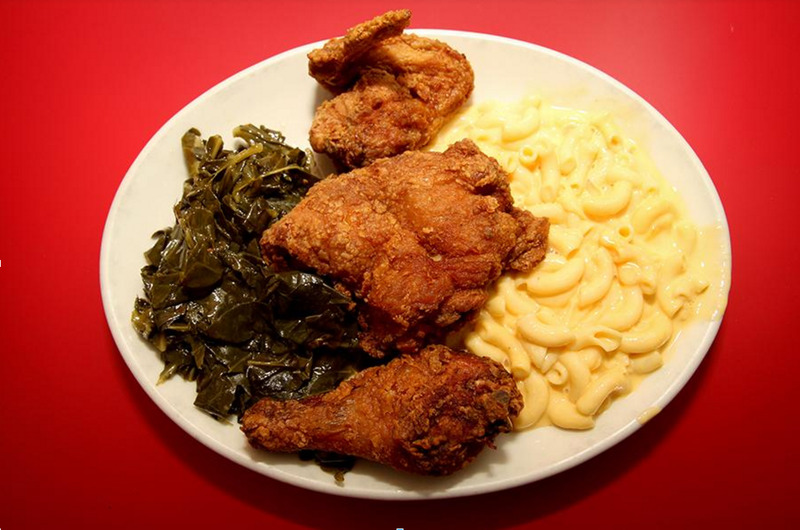 The sides are as worthwhile as the chicken itself, particularly the collard greens, candied yams and mac and cheese.